The body needs both spiritual and physical energy to function every day. Spiritual energy is provided by the “life force energy” that resides, flows and surrounds us inside and out. Basically, mitochondria are the fuel factories in our cells. They are unusual organelles surrounded by a double membrane and divide by simple fission. Although they do have other functions, the most important one is to “produce energy.” They are 24/7 busy producing the energy our bodies need to function correctly. In fact, these little energy producers provide approximately 95 percent of the energy the body uses daily. An adult human body for the most part contains on average an estimated 500 trillion mitochondria. Each tissue type contains different numbers of mitochondria from one – thousands. These powerhouses within nearly every cell in the body break down nutrients provided by the bloodstream in a process known as “metabolizing”. When combined with oxygen, the chemical fuel supply for your body is produced – adenosine triphosphate or ATP. No other part of the cell can combine oxygen and food molecules – only mitochondria. They not only regulate cell metabolism, they are also actively involved in cell growth and division and normal cell death (apoptosis). Unfortunately, the damage to mitochondria begins early on in life – back in mother’s womb when diet was the primary player. As we age, mitochondria functioning falters and declines as well as the number of mitochondria in our cells. Add to that ongoing environmental toxins, modern lifestyle stressors and exposure to pesticides and you’ve created a recipe for disease. This kind of free radical damage to “energy centers” – our mitochondria severely limits our ability to produce clean-burning fuel which in turn causes damage to brain cells and premature aging. Disease conditions ranging from cancer to diabetes, heart disease, stroke, kidney and liver impairment as well as neurodegenerative conditions like Parkinson’s and Alzheimer’s have all been associated with mitochondria damage. 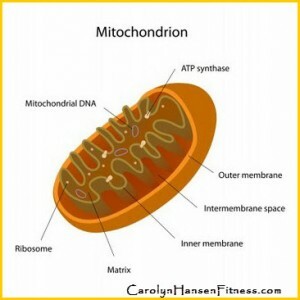 Mitochondria are unique because they are independent organelles – they have their own DNA and ribosomes. This gives them the ability to replicate, multiply and produce their own proteins. The fluid inside the mitochondria is referred to as the “matrix” and it is bound by a double membrane – the outer one that is smooth and covers the organelle and the inner membrane with many folds know as cristae. The cristae increase the available surface to help enhance the productivity of cellular respiration. Due to the high concentration of enzymes, nearly all the chemical reactions of cellular respiration take place in the inner membrane. One of the biggest reason mitochondria get damaged is the excess of poor quality foods that we eat along with a deficit of healthy ones. Empty calories from sugars, flours and other processed foods force mitochondria to burn through lots of “junk” causing free radicals to be released and inflammation along the way before nutrients are even siphoned out. Unless we are fueling ourselves with plenty of antioxidants, phytonutirents, healthy fats, proteins and fiber we are not providing our bodies the basic defense tools it requires to repair and avoid future damage. Truth is, science now believes that your health and your chance of living an extended long life filled with ‘vital energy” all depend on the health of your mitochondria, so you need to be doing all you can to protect them. It seems, the more high functioning ones your body houses, the healthier and longer you’ll live. If you are serious about achieving a truly healthy lifestyle that will take care of you long into your senior years visit “Reclaim Your Longevity” . Everything you need to live a long healthy life…dancing well into your senior years is included in this program that is geared towards helping you not only find the “fountain of youth” but bring it alive in you.